Lincoln, the county town of Lincolnshire, is one of the finest historic cities in Britain. It lies on the River Witham and is dominated by its magnificent hilltop cathedral, one of the largest in England. It also boasts many things to do, from visiting its handsome medieval houses to admiring the remains of its Roman town gates and well-preserved Norman fortifications. Indeed, it was the Normans who made the biggest mark on Lincoln, leaving behind both the castle and the cathedral. Lincoln was described in the Domesday Book as a prosperous town with a sizable population, and its office of mayor, established in 1206, is the oldest in Britain. Following its integration into the railroad network in 1846, Lincoln became a center of the iron and steel industry. While manufacturing is still important, Lincoln is today best known for its beautifully preserved historic buildings and attractive parks and green spaces, most notably the 19th-century Lincoln Arboretum. Be sure to also visit the historic Chapterhouse along with picturesque Lincoln Cathedral Close, with its remains of the Old Bishop's Palace, Cantilupe Chantry, and Vicar's Court. A monument commemorates the poet Lord Tennyson, who was born in nearby Somersby in 1809. On Castle Hill is the entrance to mighty Lincoln Castle, built by William the Conqueror after an entire quarter of the town had been cleared in 1068. In the southwest of the grounds stands the 12th-century keep, known as Lucy Tower, and in the northeast corner is Cobb Hall, a horseshoe-shaped bastion from the 1st century. Excellent views over the city can be enjoyed from the Observatory Tower, part of the attraction's third-of-a-mile "wall walk." The castle also boasts an original copy of the Magna Carta on permanent display. Dating back to 1215, it's one of only four copies in existence and is part of an exhibit that includes an insight into the document's history, something that's brought to life through first-rate video presentations. Also worth visiting is the nearby fully restored (and once notorious) Victorian Prison, where prisoners as young as eight were kept in isolation for crimes ranging from food theft to murder. Highlights include the chance to dress up in period costumes as well as interact with guides playing the roles of either warder or prisoner. Lincoln's busy modern lower town forms a striking contrast with the peaceful and picturesque old town around the cathedral. The area boasts a number of important old churches, including St. Peter-at-Gowts and St. Mary le Wigford (both built around the 10th century), with their fine Saxon towers. The latter houses a unique chandelier presented by the city because it survived the Parliamentarian siege of 1644 during the Civil War. Also worth a visit is St. Botolph by Bargate, rebuilt by locals in 1721. The St. Mary's Conduit was built in the 16th century with stone from a Carmelite friary. The High Street continues under the Stonebow, the 15th-century medieval south town gate with the Guildhall, the great council chamber, on the floor above it. It's in the Upper Town area that you'll find the most interesting of Lincoln's medieval roots. At the foot of Steep Hill are the Jew's House, a Norman stone building dating from about 1170 (now a restaurant), and the adjoining Jew's Court, the remains of a former synagogue from the end of the 12th century. Lincoln's old merchant's houses are also worth visiting and include the 16th-century Harding House; the half-timbered Harlequin, a former 16th-century inn; and Aaron's House, a Norman secular building dating from 1150. The Brayford Waterfront consists of the city's former inland port (known as the "Pool") and is fed by the River Witham, spanned by the High Bridge (1160). In the 18th and 19th centuries, it was an important handling center for agricultural products, and today the old warehouses have been turned into hotels and restaurants amid the many moored yachts and canal boats. It's a fun area to explore, and offers some great views of Lincoln Cathedral. 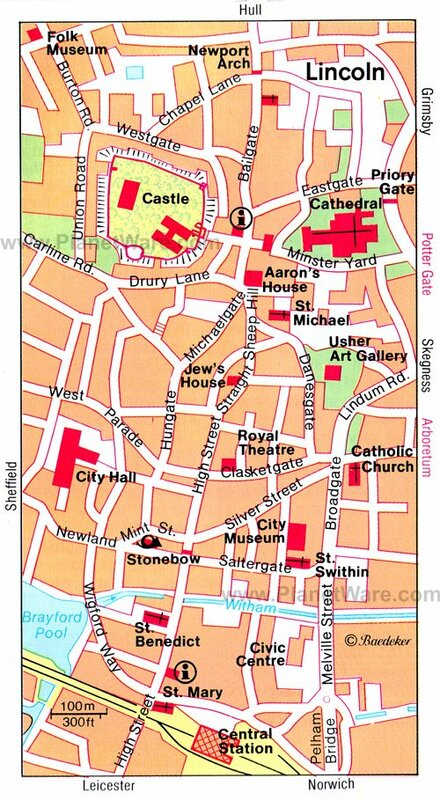 To the north of Lincoln Castle is Bailgate, the center of the ancient Roman town. Circles mark the positions of the Roman columns, and in the cellar of No. 29, the Roman House, are the remains of an old Roman basilica. St. Paul's stands on the site of the church built by St. Paulinus, who brought Christianity to Lincoln in AD 627. At the north end of Bailgate is the Newport Arch, one of two 1st-century Roman town gates in the city, and considered the best-preserved in England. A small section of Lincoln's Roman town walls can also be seen in East Bight, and The Collection - a museum in Broadgate - contains many Roman antiquities (its neighbor, the Usher Gallery, is worth a visit for its vibrant modern and contemporary art program). The Museum of Lincolnshire Life contains numerous exhibits pertaining to the region's rich and varied social history and culture from 1750 to the present. Exhibits illustrate commercial, agricultural, industrial, and community life, with a star attraction being the country's oldest WWI-era tank (the first such war machines were built nearby). Also fun is an authentic Victorian kitchen that is used for demonstrations, as is a hand-operated printing press. The museum also houses the interactive galleries of the Royal Lincolnshire Regiment and operates Ellis Mills, a working 18th-century windmill. The RAF Battle of Britain Memorial Flight, part of No. 1 Group RAF, flies out of RAF Coningsby. Located 24 miles east of Lincoln, the base's many historic aircraft are regularly seen at events commemorating WWII, as well as for state occasions, notably the annual Trooping the Colour celebrating Queen Elizabeth II's birthday, and at air displays across the country. Of particular note is the last Hurricane to be built, a Spitfire V and one of only two operational Lancaster bombers, the City of Lincoln, all of which can be seen during the museum's fascinating hangar tours. Tattershall Castle was built in medieval times for Ralph Cromwell, Lord Treasurer of England. Its six-floor keep is a fine example of a fortified brick dwelling and was built around 1440. Be prepared to do some climbing: 150 steps lead from the basement to the battlements, but it's worth the effort for the magnificent views over the Lincolnshire countryside. Afterwards, explore the grounds, moats, bridges, and neighboring church, also built by Ralph Cromwell. Another nearby stately home to visit is Doddington Hall & Gardens, a privately owned late Elizabethan mansion with stunning grounds. Located just outside Lincoln, it was completed in 1600 and has remained in the hands of the same family since. Of particular interest are the mansion's many fine 17th-century Flemish tapestries, along with impressive collections of ceramics and paintings. Located just seven miles southwest of Lincoln, Whisby Nature Park is home to plenty of wildlife in its 160 acres of lakes, ponds, woodland, scrub and grassland. For a wonderful day's exploring and sightseeing, follow the pathways and trails past Grebe Lake, beyond Orchid Glade and past the Railway Pit into Nightingale Marsh and through the Dead Forest (filled with dead birch). Near Sleaford, some 18 miles south of Lincoln, Edwardian Woodhall Spa was noted for the curative powers of its saline waters and is still popular amongst tourists. One of the earliest hotels in Woodhall Spa, opened in 1882, still stands, as does the famous Kinema in the Woods, a cinema built in 1922 that operates Britain's only back screen projector. For a special treat, try to time your visit for one of the cinema's nostalgic organ shows, where you can relive the early days of the movies when live music was performed to accompany films. Gainsborough, 18 miles north of Lincoln, is a town with many interesting historical associations. King Alfred was married here in AD 868, and the Danish king Sweyn died here in his camp in Thonock Park in 1014. During the Civil War, the town was the scene of much fighting between Royalist and Parliamentary forces. The Old Hall, one of England's best-preserved medieval manor houses, is well worth a visit for its still-used 15th-century kitchen (some of the food prepared here can be sampled in the on-site café). Gainsborough also served as writer George Eliot's model for St. Ogg's in The Mill on the Floss, with many of the places he describes still identifiable. If possible, try to plan your visit to coincide with the Gainsborough Riverside Festival, an annual arts and heritage event that runs in June.